This morning's Oscar nominations announcement recycled many of the season's usual suspects, while it also provided us with quite a few surprising snubs. First of all, let's stop pretending Moneyball is a good movie. No matter how many awards it gets nominated for, or performances that are oddly complimented, this is a poor movie that offers no compelling story and two of the biggest phoned-in performances from last year from Brad Pitt and Jonah Hill. What version of this movie did Oscar see? I need that dvd. Speaking of lost in translation, it seems like the handwriting is on the wall for The Help. Clearly this award season is all about throwing the maids some love, even though we all know both Viola Davis and Octavia Spencer are better than their okay performances in a lackluster movie. I blame the source material. But since we're talking about it, if we're going to surprise nominate anyone from The Help, it would have been more settling to see Allison Janey on the nominations ballot and not Jessica Chastain's underwhelming performance of a caricature in the movie. It's also worth noting that at today's announcement ceremony, a picture of Chastain in The Tree of Life flashed on the screen, in lieu of a picture of her in The Help. Coincidence? She was indeed better in The Tree of Life, even though the movie itself is downright frustrating to watch. Notable surprises include Rooney Mara's nod in the best actress category for her performance in The Girl with the Dragon Tattoo and Demián Bichir for best actor in the very quiet but solid movie A Better Life. While both were impressive, I can't help but to think Adepero Oduye's touching performance in Pariah could have aced this category in lieu of Mara's solid performance of character to whom she brought nothing. By the way, Pariah received NO nominations, in any category. Zilch. Nada. Who can I write to about this tragedy? Let's talk about some of the other snubs. Albert Brooks for Drive and and the entire institutes of Young Adult and Shame were robbed! There is NO reason for them not to be here. Michael Fassbender? Diablo Cody for the wonderfully daring Young Adult? But Jonah Hill and Brad Pitt are here? Stop the madness. And nothing for Carey Mulligan. These are all crimes against humanity. 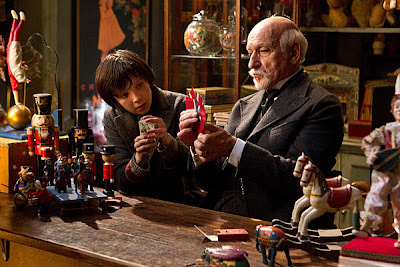 In other news, thankfully Midnight in Paris, Nick Nolte (the best part about Warrior) and Christopher Plummer (for his touching portrayal in Beginners) all received well-deserved nods. We can take comfort in at least that. Demián Bichir, "A Better Life"
Max von Sydow "Extremely Loud & Incredibly Close"
Young Adult should have AT LEAST received a nod for Best Orig. Screenplay. Also, I think Patton Oswalt should've received the nod instead of Jonah Hill. Oswalt was WAY better than Hill. And I'm wearing black in mourning for the Shame snub. This year I have only seen The Tree of Life out of all the best picture nominees, so I can't really comment on the quality of the films yet, but surely it can't be as awful as the overrated bunch of films nominated last year?